Boot Düsseldorf 2012: Back Row (L-R) Felix Happe, U.S. Commercial Service/Germany; Karel Vantomme, U.S. Commercial Service/Belgium; Angela Turrin, U.S. Commercial Service/Spain; Phillip Stevens, Riddle Marine, Inc.
…and they did! In a big way! 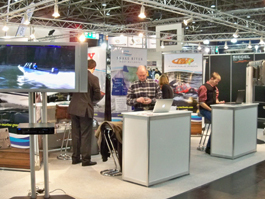 The Snake River Boat Builders Export Program just completed participating in its second Snake River Boats Pavilion at boot Düsseldorf 2012, Düsseldorf, Germany, January 21 – 29, 2012. This program has been a collaboration between the public and private sectors since its inception in the Spring of 2010. It is an excellent example of how the two sides can work together to accomplish a single economic development goal. One of the key public sector partners in this export development project has been the U.S. Commercial Service. Boot Düsseldorf 2012: (L-R) Felix Happe, U.S. Commercial Service/Germany; Bryan Bentz, Bentz Boats, LLC. 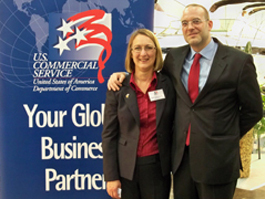 ; Janet Bauermeister, U.S. Commercial Service/U.S.A. ; Phillip Stevens, Riddle Marine, Inc. Boot Düsseldorf 2012:(L-R) Bryan Bentz, Bentz Boats, LLC. ; Janet Bauermeister, U.S. Commercial Service/U.S.A. ; Felix Happe, U.S. Commercial Service/Germany; Phillip Stevens, Riddle Marine, Inc.; Jaynie Bentz, Bentz Boats, LLC. Market Intelligence to help U.S. exporters target the right market(s) for their products and services. Trade Counseling to provide U.S. exporters with the information they need to navigate the export process. Business Matchmaking services to connect U.S. exporters with the right partners and prospects. Back to the Snake River Boat Builders Export Program. 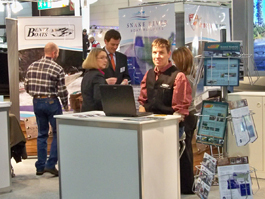 Paul Warren-Smith, U.S. Commercial Service, Frankfurt, Germany, recommended and coordinated our participation in boot Düsseldorf 2011, as well as press coverage in Skipper Boote Und Yachting and a 2010 in-bound trade mission of German and Dutch boat buyers. Last September, we brought in four Commercial Service Trade Specialists; Angela Turrin (Spain), Berrin Ertürk (Turkey), Karel Vantomme (Belgium) and Felix Happe (Germany). They toured each of the participating boat manufacturers and left convinced these boats were some of the “coolest boats in the known world” with great potential in Europe. With desktops, laptops, smart phones and tablets in hand, they aggressively promoted the Snake River Boats to the media and boat buyers in their countries. I have to admit, these folk know how to market a group of Washington and Idaho boat manufacturers! It began with the first ever Snake River Boats stand at Salón Náutico Internacional de Barcelona in November, 2011. This is the largest marine trade show in Spain and one of the most important in Europe. Angela Turrin (Spain) did a wonderful job in promoting the companies participating in the program. 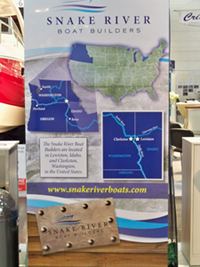 Not only did she arrange for a well located exhibition stand (at no charge to the program), she was able to arrange a multi-media presentation of the Snake River Boats DVD, a dedicated press conference and introductions to Spanish boat importers. Not to be left behind, Berrin Ertürk (Turkey) was responsible for a four page article on the Snake River Boat Builders in the Turkish magazine Naviga, which boasts the largest circulation of the marine trade magazines in Turkey. 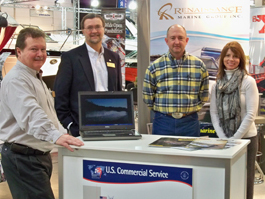 Boot Düsseldorf 2012: Bruce and Dan Larson, Renaissance Marine Group, Inc.; Bryan and Jaynie Bentz, Bentz Boats, LLC. Come January and boot Düsseldorf 2012, I am not sure what we would have done without the help of the U.S. Commercial Service office in Düsseldorf. I want to personally thank Lora A. Baker, Commercial Consul and Nils Roeher, Commercial Specialist for all of their help. They received and stored our trade show materials, delivered them (and us) to Messe Düsseldorf, helped set-up our stand, tear-down our stand and shipped our materials back to the good ole USA. And to top it off, they provided a great translator and tons of advice and encouragement. 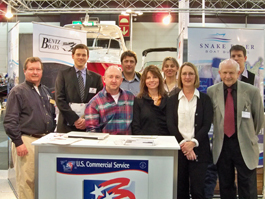 The U.S. Commercial Service was also able to get us on the “boot Düsseldorf News”, www.boot.de/SnakeRiverBoats. had the pleasure of “working the show” with Angela, Karel Vantomme (Belgium) and Felix Happe (Germany), talking with contacts they had made (and encouraged to come to the show and meet the Snake River Boat Builders) and making new contacts. Their mastery of several languages was extremely helpful. These are not only great marketing people, but great people! So, when the U.S. Commercial Service comes knocking on your door and says, “we’re the government and we’re here to help,” LET EM IN!